>>The name Aria was inspired by my son, Aarya, who loves music. This collection is a dainty extension of the Lucca collection, which was inspired by the filigree arcs on the doors of Venice, Italy. 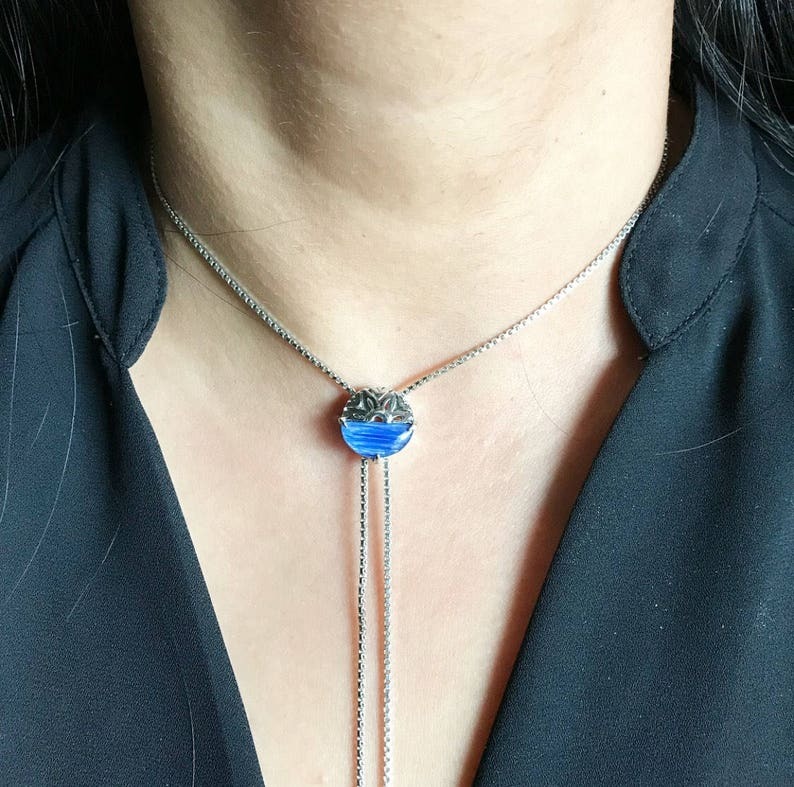 Simple, stylish, this bolo style necklace is perfect for any elegant occasion or for an everyday wear. Entire length of chain strand/necklace including the drop is about 32 inches long. Extra bright and sparkly. >> Shipping and whats in the box? Please Note: Due to the natural nature of the gemstones, the color and pattern may slightly vary from the picture. I recommend to avoid shower, swimming or sleeping with this item. If you have any other question feel free to send me a message!! >>THANK YOU FOR YOUR SUPPORT! Thank you so much for visiting Prachi Bhise Jewelry and I’m especially grateful to anyone who’s purchased from me. Turquoise bracelet. Bolo bracelet. Turquoise jewelry. Jewelry gift. Dainty jewelry. Adjustable jewelry. Chain and link bracelet. Gorgeous workmanship! Arrived quickly and safely. Much thanks! Beautiful necklace. Just as pictured. Yes, I can do that! If you need an item on a specific date, please message me to check the availability, and I'll do my best to meet your request. Every piece of Prachi Bhise Jewelry comes with a branded box with care instructions. Please message me for your wholesale needs, and I'll do my best to assist you. To maintain the beauty of your jewelry, remove them before you swim, shower, or work out. It should never be place in or near water for an extended period of time. Avoid spraying or applying perfume, soap, or lotion directly on or near your jewelry. After wearing please wipe your jewelry with a soft cloth.